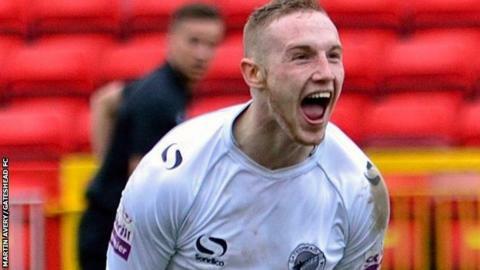 Peterborough United have signed Gateshead forward Marcus Maddison for an undisclosed fee. The 20-year-old, who has scored four goals in five games for the Conference side this season, has agreed a four-year deal at London Road. He was released by Newcastle United last summer and went on to feature 32 times last season, scoring nine goals. "He has good balance, skill, pace and we feel this could be a good signing," said Posh boss Darren Ferguson. "He has been to Newcastle, gone to Gateshead and done very well. He is a player that has had a go at the big time, it didn't quite work out as he had hoped but he has gone into the non-league and is on his way back up again. "He can play on the right, up front, on the left or in the number 10 role." Maddison featured in last season's Conference play-off final defeat by Cambridge United, and finished the campaign with eight bookings and two red cards.